School of Pharmacy, Faculty of Medical and Health Science, University of Auckland, New Zealand. ABSTRACT: The sublingual delivery of drugs represents a continuing challenge, as well as an opportunity. In this study, a poly (lactic-co-glycolic acid) (PLGA) based Water-in-Oil-in-Water (w/o/w) double emulsion of nanoparticles was developed as potential platform technology, to generate sustained drug release profile and maximize the bioavailability of the glutathione (GSH). Two-level full factorial design was carried out based on different types and concentrations of the stabilizers used, and on varying sonication time. The optimal formulations were predicted with particle size of 232.57 ± 20.56 nm, zeta-potential of -12.33 ± 0.20 mV and entrapment efficiency of 77.04 ± 1.50%. Spherical particle morphology and uniform size was observed by scanning electron microscopy. Sustained release profile was achieved and the release kinetics was illustrated as a Korsmeyer - Peppas kinetic model. Moreover, in ex-vivo permeation studies, approximately 2-fold increase in the transmucosal permeation of GSH was achieved when PVA and carbopol were incorporated with the nanoparticulate delivery system, resulting in 21.9 ± 1.2% drug permeation and a permeation coefficient of (4.96 ± 0.36) × 10-6 cm∙sec-1. The developed PLGA nanoparticulate delivery system was able to elevate the retention time and resist saliva dissolution, providing a sustained drug release profile and relatively high transmucosal permeation of GSH. INTRODUCTION: GSH is one of the most essential and powerful antioxidants in the human body system. It helps recycle Vitamin C and E, while maintaining its antioxidant activities. It may well be the most important antioxidant that the cells of our body produce, helping to neutralize reactive oxygen compounds and free radicals 1. Unfor-tunately, increasing the body’s levels of GSH is not always easy, as much of the substance is lost in the digestive system, and the small amount that does get through is usually insufficient to be of any real benefit. Moreover, because it has a very short plasma half-life of approximate 2.5 min 2. Therefore, a novel drug delivery system which is able to achieve sustained drug release and greater bioavailability is desirable. Sublingual drug delivery involves delivering the drug to the sublingual region of the oral cavity, through the mucosal membrane into the systemic circulation. The application of drugs to the surface of mucosal tissue is a convenient and painless method of administration, bypassing the hepatic first-pass effect and avoiding enzymatic degradation in the gastrointestinal tract. It is necessary for the drugs to be retained for a sufficiently long period of time, to achieve the desired therapeutic effect 3. However, disadvantages are also involved in this delivery route. The small available surface region of administration site is one disadvantage and the fact that saliva may wash off the dosage is a main concern with regard to retention of the drug components 4. Moreover, there are the physical barriers and the biochemical barriers to sublingual delivery. The physical barriers are include the saliva and mucus layer, mucosal epithelium and the basement membrane, while with biochemical barriers, the drug candidates can be degraded by the metabolizing enzymes from the sublingual region 5. Nanoparticles (nanospheres) for sublingual drug delivery can be defined as submicron (1 to 1000 nm) colloidal particles from natural or artificial polymers, in which the drug molecule is adsorbed, dissolved or dispersed throughout the matrix 6. The advantages of using nanoparticles as drug carriers for sublingual delivery include: high carrier capacity; the capability of both hydrophobic and hydrophilic drugs to be encapsulated allowing controlled drug release; prevention of enzymatic degradation; versatility of the nanoparticles and their availability in a wide range of modifiable structures, which help in targeting specific sites of action; generation of good stability meaning longer shelf life 7. Poly (lactic-co-glycolic acid) (PLGA) is a copolymer which is used in a host of Food and Drug Administration (FDA) approved therapeutic devices. Owing to its biodegradability and biocompatibility, it does not lead to polymer accumulation in the body as it has a natural degradability to non-toxic metabolites that can then be excreted from the body 8. Indeed PLGA particles are extensively investigated for drug delivery, but there are still improvements needed in the existing methods to overcome the difficulties in terms of reproducibility, size, and shape. The size and shape of the colloidal particles are influenced by the stabilizer and the solvent used 9. Therefore in this study, different types and concentrations of stabilizer were investigated such as polyvinyl alcohol BF17W (PVA), carbopol, methyl cellulose (MC), hydroxyl propyl pyrolidine (HPMC) and poloxamer. It is suggested that a fraction of PVA always remains associated with the nanoparticles despite repeated washings because PVA forms an interconnected network with the polymer at the interface 10. Moreover, the stability and biological activity of the nanoparticles have been major concerns due to the involvement of organic solvents during the preparation process 11. A strategy for evaluation and optimization of the parameters of delivery systems in an efficient approach is necessary. Two-level full factorial design was applied in this study to optimize the pharmaceutical process to yield a maximum or minimum response based on the relationship between dependent variables (responses) and controllable (independent) variables. Response Surface Methodology (RSM) is a collection of mathematical and statistical techniques that can be used to develop, improve or optimize products. RSM typically is used for the modelling and analysis of problems in which a response of interest is affected by several variables with the objective of optimizing this response. It appears that using GSH-loaded polymeric nanoparticles for sublingual delivery has not yet been reported in the literature. The aim of this project is to develop a GSH-loaded PLGA based double emulsion of nanoparticles as a carrier delivery system via sublingual administration, to achieve improved bioavailability in a controlled release manner. The present work deals with the fabrication of PLGA nanoparticles by solvent evaporation method and optimal formulations were predicted by factorial design method based on particle size and EE results, in-vitro drug release profile and ex-vivo drug permeation studies were investigated. The results indicated that the developed optimal PLGA nanoparticulate delivery system can provide a promising formulation platform from which to develop commercial products of GSH for sublingual drug delivery. Materials: PLGA was supplied by PuracBiochem, USA.PVA was purchased from Ajax Finechem, Australia. Carbopol 971NF was obtained from Noveon, USA. MC was supplied by ICN Biomedicals, USA. Chitosan was obtained from Fluka, Israel. Poxolamer 188, HPMC and GSH were purchased from Sigma-Aldrich, USA. Ethyl acetate, acetic acid, Milli-Q water were laboratory analytical grade. Preparation of Nanoparticles: PLGA dissolved in 3 mL of ethyl acetate, and 0.6 mL of 1% w/v drug solution was added dropwise into PLGA solution forming a w/o emulsion and was sonicated at an output of 20 W for 60 seconds by ultrasonicator (Model UP 200S, Hielscher, Germany). This was then poured into a solution of PVA, and sonicated at an output of 20 W for the required time to form a w/o/w double emulsion. Solvent was evaporated using a rotator evaporator (V-850 model, Buchi®, USA) after which the resulting nano-suspension was centrifuged with relative centrifugal force of 173210 g for 40 min to harvest the nanoparticles by using Ultracentrifuge (Wx Ultra 80 model, Thermo Scientific®, USA), washed thoroughly by 5% w/v sucrose solution twice and freeze-dried for 24 hours at -50 ºC (Model Freezone 6, Labconco, USA). Factorial Design: A two-level full factorial design method (Design-Expert®, version 7.0, State-Ease inc, Minneapolis, MN, USA) was applied to predict the optimal formulation. The three independent parameters were different stabilizers, different concentration of the stabilizers used, and different sonication times applied during the preparation procedure. The normalized factor levels of independent parameters are given in Table 1. Particle size and EE were evaluated as dependent variables, which were also defined as response. The total number of formulations was automatically generated by the software subjected to the level of factors in Table 1. Particle size and EE of the formulations were determined. Then the software could predict the optimal formulation according to the desirability of smaller particle size and higher EE 12. Particle Size, Size Distribution and Zeta Potential: The particle size, size distribution and zeta potential of nanoparticle were measured by Malvern Zetasizer (Zetasizer Nano ZS, Malvern, UK). Nanosuspension samplebefore freeze-dried was diluted 20 times with milli-Q water prior to the measurements. The Average diameter of the particle (Z ave) and the zeta potential (mV) was determined. The factorial design software predicted the optimal formulations with smaller particle size and greater EE. The formulations were used to further conduct in-vitro drug release and ex-vivo drug permeation studies. In-vitro Drug Release Studies: The in-vitro drug release was carried out using Franz diffusion cells (VTC 200, Logan, USA) with cellulose membrane (MW range from 8000 Da to 14000 Da) sandwiched between donor and receptor chambers. Sodium dihydrogen phosphate monohydrate buffer (0.1 M, pH 6.5) containing 13.8 g/L of sodium dihydrogen phosphate monohydrate was used as the medium, while the temperature was maintained at 37 ± 1 °C. GSH (1% w/v), and drug loaded nanoparticles with equivalent GSH amount, were added to the donor chamber. An aliquot sample of 0.5 mL was withdrawn at different time intervals over 12 hours, and replaced by 0.5 mL of fresh medium. All the samples were filtered by 0.22 µm MS® PES syringe filters prior to HPLC determination 13. All experiments were conducted with triplicates, and results are given as mean ± SD. In-vitro Release Kinetic Modelling: Model dependent methods are based on different mathematical functions, which describe the dissolution profile Table 2. Once a suitable function has been selected, the dissolution profiles are evaluated depending on the derived model parameters. In order to investigate the mode of release from the optimized formulations, the previous in-vitro release data were analysed using the following mathematical kinetic models, in order to understand the drug release mechanisms and the kinetics 14. Ex-vivo Drug Permeation Studies: The Franz diffusion cells were also used in this study. Permeability was measured with porcine mucosal epithelial membrane soaked in 0.1 M sodium dihydrogen phosphate monohydrate buffer (pH 6.5) overnight, and sandwiched in between the donor and receptor chambers. GSH (1% w/v), and drug loaded nanoparticles that were equivalent to 1% w/v GSH were added onto the mucosal surface in the donor compartment. An aliquot sample of 0.5 Ml was withdrawn at various time intervals from the receptor chamber and filtered with 0.22 µm MS® PES syringe filters. The same volume of medium was replaced in the receptor chamber after each sampling 16. The concentration of gemcitabine was then determined by HPLC. All experiments were conducted with triplicates, and results are given as mean ± SD. Scanning Electronic Microscopy (SEM) Morphology Studies: Small amounts of freeze-dried nanoparticles samples were placed on a grid and dried at room temperature overnight and sputter-coated with gold and palladium. They were then observed under a condition of high vacuum and temperature of less than -120 ºC using SEM (XL30S FEG model, Philips, USA) at 25 kV. Statistical Analysis: All data reported are means of triplicates, with standard deviation as the errors. Additionally, differences in Papp between different formulation groups were evaluated using one-way ANOVA followed by Tukey’s test. Probability estimates of P < 0.05 were considered to be significant. All analyses were carried out using MINITAB (version 17). Particle Size and Size Distribution: Particle size is a key factor influencing the rate and extent of permeation across the cell membrane as well as the stability of the formulation. Large particle size distribution might lead to aggregation thus slow drug release rate and reduction in permeation as a result 17. The results showed that particle sizes ranging from 100 to 500 nm were measured, a size beneficial for drug permeation over oral mucosa tissue 18. 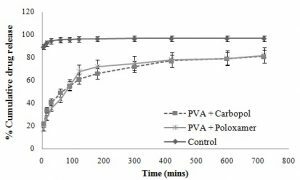 PVA carbopol group showed the relatively smaller particle size compared to other groups. Additionally, particle size of 232.57 ± 10.56 nm with PdI of 0.278 was obtained with carbopol combining with PVA and used as stabilizer, which appeared smallest among the formulation. This can be explained by the fact that carbopol itself is a good stabilizer 19. Moreover, The PVA is known to form layers of aggregates around the surface of nanoparticles contributing towards the hydrodynamic diameter of nanoparticles 20. After the removal of organic solvent, more PVA stabilizer molecules can be physically incorporated onto the surface of nanoparticles and then a large number of hydroxyl groups extending into the continuous phase could be hydrated, forming a surface layer that will hinder nanoparticle aggregation 21. From Fig. 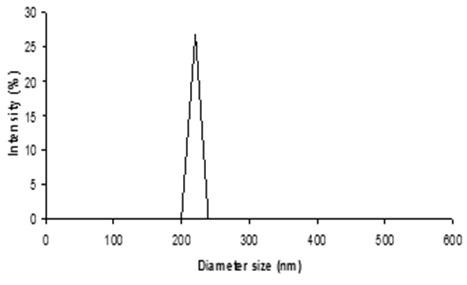 1, the size distribution of one of the optimal formulation has shown an intensity peak with relatively high percentage intensity indicating the good uniformity of the particles of this formulation and low particle aggregation and drug leakage 22. 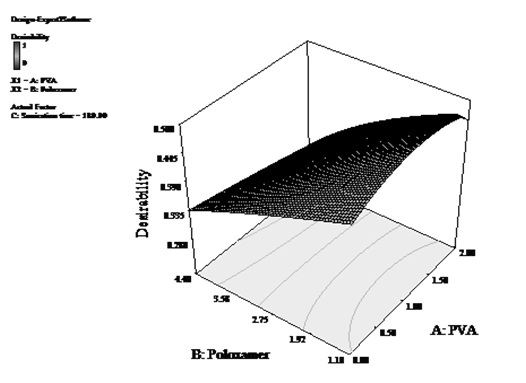 In addition, the polydispersity index (PdI) describes variation in sizes. The higher the PdI value, means the wider the particle size distribution and vice versa 23. For this formulation, the low PdI value indicates the promising uniformity of the particles. Morphology Studies: Scanning electronic microscopy showed that isolated PLGA nano-particles were uniform, spherical and well defined in shape with smooth surface Fig. 2. When PVA was alone used in the preparation the particle size was about 250 nm. It showed that when other stabilizing polymers were combined to use, SEM analysis showed larger particle size of over 300 nm. 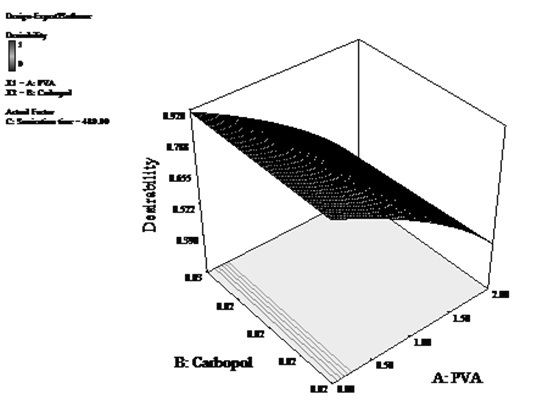 PVA and carbopol formulation appeared to have smallest size distribution, indicating better size uniformity of the formulation. However, some of the particles had aggregated due to the high energy centrifugation that forces the particle back together to form aggregates 24. Zeta Potential: The zeta potential of all the formulations appeared to have negative values that were within a range from -0.10 mV to -12.5 mV. The negativity ranking of zeta potential of the four groups is PVA and carbopol> PVA and poloxamer > PVA and HPMC > PVA and MC. From the results, polymers carbopol and poloxamer were found to have a significant influence on the zeta potential value of the PLGA nanoparticles. The optimal formulation of PVA and carbopol had a relatively greater negative value of zeta potential of -12.33 ± 0.10 mV, which indicated the more stable of the formulations 25. The zeta potential value is an important particle characteristic as it can influence both particle stability as well as particle muco-adhesion. This is due to the fact that zeta potential represents the stability of the colloidal dispersion and the extent of repulsion between nanoparticles, thus there is less likelihood of aggregation due to the presence of the same charge layer which will repel the nanoparticles away from each other 25. In theory, more pronounced zeta potential values, being positive (≥ 30 mV) or negative (≤ -30 mV), tend to stabilize particle suspensions 26. The optimal formulation of PVA and carbopol had a relatively larger negative value of zeta potential which is preferred. This may be due to the fact that PVA and carbopol contain high proportions of hydroxyl and carboxyl groups respectively, therefore these create a negative shell layer surrounding the nanoparticles 27. Entrapment Efficiency: The range of EE of the formulations was from 66% to 79%. And the optimal formulation had an EE of 77.04 ± 0.50%. There was a trend of an increase of EE when the PVA concentration increases. A possible explanation for this phenomenon is that an increase in PVA concentration may increase the viscosity of the external water phase. This in turn elevates the difficulty for diffusion of the drug into the external water phase, which in turn leads to increase drug retention in the particle and a higher EE 28. In other words, the presence of increasing PVA concentration might serve as a barrier to prevent the diffusion of the drug out of the polymeric shell, resulting in the gradual increase of EE when the PVA concentration is elevated 29. Another phenomenon was an increase in EE when the 2nd sonication duration was reduced from 180 sec to 480 sec for 2nd sonication duration time when EE was reduced about 5%. This could be explained by the increased sonication time leading to breakage of the particles, and resulting in leakage of drug 30, thereby a lower EE was obtained. Moreover, the 30% unentrapped drug that was determined might have been due to the fact that the precipitation of PLGA was not fast enough for the drug to diffuse into the outer aqueous phase during the fabrication process. It is known that the amount of drug entrapped within the particles is dependent on the speed of polymer precipitation from the organic phase 28. GSH is very soluble in the outer aqueous phase. This property coupled with the concentration gradient between the inner and outer aqueous phases drives GSH to diffuse into the outer aqueous medium via the organic layer. Additionally, subjecting the particles for centrifugation to precipitate the particles from the supernatant could also cause the release of some GSH during the process 31. Furthermore, the lack of sufficient time to allow PLGA to undergo polymerization could account for less drug entrapment in the PVA stabilized loaded particles 32. Prediction of Optimal Formulations by Factorial Design: All the data generated from particle size and EE of the formulations were entered into the factorial design program and the optimal formulation was predicted based on the desired response of smallest particle size and highest EE. The two resultant optimal formulations are (i) 0.20% w/v PVA and 0.03% w/v carbopol with 480 sec 2nd sonication time (Desirability: 0.917), and (ii) 2.00% w/v PVA and 1.10% w/v poloxamer with 180 sec 2nd sonication time (Desirability: 0.471). The statistical analysis of variance by ANOVA for selected factorial model was evaluated. All the formulations had a p value ‘Prob> F’ of between 0.010 to 0.041. Values of ‘Prob> F’ less than 0.050 indicate model terms are significant. ‘Adeq Precision’ values of formulations were between 7 to 10. ‘Adeq Precision’ measures the signal to noise ratio. A ratio greater than 4 is desirable, thus all the formulations indicated an adequate signal, and this model can be used to navigate the design space 12. The data was fit to a quadratic model of which the parameters were those of different types of the stabilizer combined, different concentrations used and different 2nd sonication times. The optimal formulation was automated, and a graphical representation of the measured points and the response surface is given in Fig. 3 and Fig. 4. For Fig. 3, the smaller particles and higher EE are obtained at higher level of carbopol and lower level of PVA. This can be explained by the fact that carbopol itself is a good stabilizer for the PLGA emulsion formed during the preparation of theparticles 33. With high concentration of both PVA and carbopol, the viscosity of the outer stabilizing aqueous phase was very high. Consequently, at a constant energy input from the ultrasonic probe during the 2nd sonication process, larger emulsion droplets were formed in the w/o/w emulsion, thus larger particles were obtained 33, 34. Additionally, sonication time also had a dominant effect on the particle size and EE, the longer sonication time of 480 Sec was predicted for optimal formulation, as the longer sonication time leads to reduction of particle aggregation, thus reducing the particle size. However the promising stabilizing effect of carbopol resulted in a higher EE. For Fig. 4, concentration of PVA had a dominant effect on particle size and EE while concentration of poloxamer and sonication time showed a minor effect. 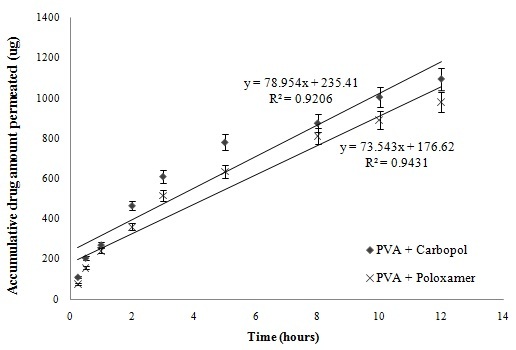 Poloxamer, in this case was shown to be less favorable than PVA in stabilizing PLGA emulsion, thus the higher PVA concentration generated smaller particle size and greater EE than having greater concentration of poloxamer or both of poloxamer and PVA. Thus we can conclude that the effect of the concentration of poloxamer is of a much smaller extent on particle size and EE. Consequently, minimizing the particle size and maximizing the EE can be obtained by having higher PVA concentration of 2% w/v, and lower poloxamer concentration of 1.1% w/v. In-vitro Drug Release Studies: From Fig. 5, for the plain drug solution (the control), over 92.4% of drug was obtained in receptor chamber over 15 min. For the optimal GSH loaded nanoparticle formulations, they displayed a sustain release profiles. The formulations produced a biphasic drug release profile with the occurrence of burst phase of approximate 20% of drug released within 15 min, this was caused by the detachment of the GSH adsorbed on the surface of nanoparticles and/or to the release of drug encapsulated near to nanoparticle surface 35. Another explanation of burst release of the formulations was that of the particles having a more porous surface as the external volume was increased. Subsequently, the encapsulated GSH maintained sustained release until approximately 80% of the loaded drug amount was determined within 12 hours. This sustained and prolonged drug release was due to diffusion coupled with erosion. The release process was controlled by more than one process which is discussed in the release kinetic modelling section. The drug loaded nanoparticles did not achieve in 100% release over 12 hours, this may have been due to the presence of the oily phase within the double emulsion nanoparticles, whereby it may have failed to degrade in the medium during the in-vitro drug release study, with the result that some of the drug encapsulated within the nanoparticles was not released 36. In addition, during the preparation of nanoparticle process, the repeated washing by 10% v/v sucrose solution might also cause drug loss to some extent. In-vitro Release Kinetic Modelling: The modelled kinetic parameters are reported in Table 3. The release data is subjected to goodness of fit test (r2) by linear regression analysis according to the selected release kinetics models. To study the zero order release kinetics, data obtained from in vitro drug release studies were plotted as % cumulative amount of drug released versus time, and this model describes the systems where the drug release is independent of its concentration. Under the zero order kinetic, the drug diffuses out in a controlled manner from the nanoparticles. It was plotted by the cumulative amount of GSH release vs time for zero order kinetics 14. The r2 values for the zero order kinetics are of 0.5839 and 0.5347 for PVA and carbopol and PVA and poloxamer nanoparticles respectively, which are relatively small. This suggests the drug release does not comply with zero order. The first order drug release describes the release from the delivery systems where the rate of release is concentration dependent. This relationship can be used to describe the drug dissolution in pharmaceutical dosage forms such as those containing water-soluble drugs in porous matrices 14. The first order release profile is achieved by plotting the logarithm of cumulative percentage drug remaining vs time. This model shows a relatively low r2 of 0.6937 and 0.6125 for the two formulations, indicating that GSH release occurs independently of the amount of drug remaining in the carrier 14. Higuchi model describes the release of drug from an insoluble matrix, taking into account the volume of the dosage form accessible to the dissolution media changes that occur with time 15. This model can be analysed by plotting the amount of drug released vs square root of time, the process is based on Fickian diffusion. It is characteristic for nanoparticles where drug release is governed by pure diffusion. Penetration of the media into the dosage form is dependent on the matrix porosity and polymer relaxation 37. The r2 values are of 0.7849 and 0.7427 for the two formulations, which are relatively low for fitting into the Higuchi model, indicating that the release of drug from matrix was not significantly driven by Fickian diffusion 37. A Korsmeyer-Peppas model can be obtained by plotting log cumulative percentage of drug released vs log time for the drug release. From the results, GSH release from the two formulations following the Korsmeyer-Peppas model and the goodness fit test r2 are of 0.9854 and 0.9824 for the two formulations. The diffusional release exponent (n) in the model gives an indication of the diffusion mechanism Table 4. The release exponent n is 0.4605 and 0.4992 for the two formulations, which indicates that the drug release is governed by diffusion through the nanoparticles matrix as well as matrix erosion, so called anomalous diffusion. This anomalous diffusion is evidence that GSH released from the optimized nanoparticles is controlled by more than one process 36, 38. Overall in-vitro release data indicates the two optimized formulations are capable of sustained GSH release rate over time. And the drug release kinetics indicate that the drug release is best explained by Korsmeyer - Peppas model, which is indicative of an anomalous diffusion mechanism or diffusion coupled with erosion, confirming that the GSH release from these nanoparticles is controlled by more than one process. Ex-vivo Drug Permeation Studies: From Fig. 6, it showed the transmucosal permeability of GSH released from the nanoparticles of the two selected formulations hada minor variation, with a maximum of 21.9 ± 1.2% of drug permeated across mucosal epithelial membrane for PVA and carbopol formulation, and 19.6 ± 1.1% for PVA and poloxamer formulation over 12 hours. The rate of drug permeation was steady, with a faster drug permeation rate for the first 3 hours and subsequently a more gradual permeation profile was observed. Where, Xr is the accumulative amount of GSH (µg) in receptor chamber, A is the surface area of the mucosal tissue (cm2), and C0 is the initial concentration of GSH in donor chamber (µg∙ mL-1). The value of dXr/dt is 78.954 and 73.543 for PVA with carbopol, and PVA with poloxamer formulations, respectively Fig. 6. The surface area A is 1.77 cm2 and C0 is 2500 µg/mL. Therefore the average value of Papp of PVA with carbopol, and PVA with poloxamer formulations are of (4.96 ± 0.36) × 10-6 cm∙sec-1 and (4.62 ± 0.27) × 10-6 cm∙sec-1, respectively. 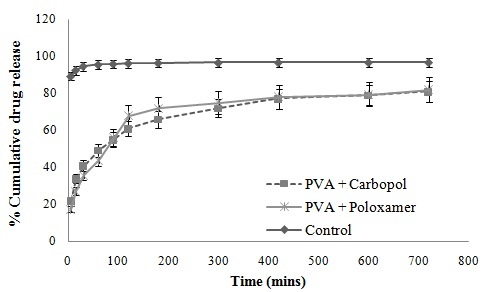 Both optimized formulations significantly increased the permeability of GSH across the porcine mucosal epithelial membrane compared to that of pure GSH solution, with PVA and carbopol enhancing the permeability of GSH is slightly greater than PVA and poloxamer, as illustrated by their Papp values. From ex-vivo permeation studies, it was demonstrated that rapid drug release from nanoparticles onto the mucosal surface is beneficial for the enhancement of drug permeation, as it enables the generation of a high concentration of the drug on the mucosal surface and the achievement of a high permeation gradient across the membrane 39. However, a highly soluble drug might have limited retention time in the buccal cavity due to the salivary wash-off, thus a smaller size of nanoparticles is being targeted to be used to encapsulate drug and penetrate through the porcine sublingual epithelial membrane. In addition, this study demonstrated that the rate of drug permeation was steady, and similar permeability of the two final optimal formulations was observed. However, in order to optimize the permeability of the formulation, smaller particle size should be formulated, due to the fact that smaller particle size leads to larger surface area and increase the rate and amount of drug release. Additionally, permeation enhancers with higher permeability with limited toxicity could be considered to be used. For instance, permeation enhancement agents could be screened and selected, the biological compound could be conjugated to biocompatible and non-immunogenic polymers, and formulation techniques could be further investigated. Further work is recommended to support its efficacy claims by long term pharmacokinetic and pharmacodynamic studies in human beings. In particular the need for safe and effective sublingual permeation / absorption enhancers is a crucial component for a prospective future in the area of sublingual drug delivery in order to improve permeation over the sublingual mucosa, thus improving drug bioavailability. CONCLUSION: The drug GSH was successfully encapsulated into PLGA nanoparticles using the double emulsion solvent evaporation method. The formulation parameters were investigated. These included different combinations of PVA and various stabilizing polymers (carbopol, MC, HPMC and poloxamer), and different concentrations of all the polymers as well as different 2nd emulsifying sonication times. Optimized formulations were generated by factorial design based on smaller particle size and higher EE as desired results. The optimized formulations were evaluated on their in-vitro drug release characteristic and ex-vivo drug permeability, and satisfactory results were obtained. Thus we can conclude that the PLGA based double emulsion nanoparticle may provide a promising platform for the development of commercial sublingual products of GSH and the technology may be able to be applied to a wide range of protein and peptide drugs. However, in order to achieve better therapeutic effect, higher percentage of cumulative drug permeation would be expected, thereby, in future studies should include more advanced formulations involving promising permeation enhancers to be investigated. ACKNOWLEDGEMENT: Dr. Mary Mckendrick’s contribution in proof reading the article. PLGA samples were kindly gifted by Purac Biochem Company. CONFLICT OF INTEREST: The author declares no conflict of interest. Roh JL, Jang H, Kim EH and Shin D: Targeting of the glutathione, thioredoxin, and Nrf2 antioxidant systems in head and neck cancer. Antioxidants and Redox Signaling 2017; 27(2): 106-114. Quinn JF, Whittaker MR and Davis TP: Glutathione responsive polymers and their application in drug delivery systems. Polymer Chemistry 2017; 8(1): 97-126. Bind AK, Gnanarajan G and Kothiyal P: A review: sublingual route for systemic drug delivery. International Journal of Drug Research and Technology 2017; 3(2): 5. Lopez FL, Ernest TB, Tuleu C and Gul MO: Formulation approaches to pediatric oral drug delivery: benefits and limitations of current platforms. Expert Opinion on Drug Delivery 2015; 12(11): 1727-1740. Kalia V, Garg T, Rath G and Goyal AK: Development and evaluation of a sublingual film of the antiemetic granisetron hydrochloride. Artificial Cells, Nanomedicine, and Biotechnology 2016; 44(3): 842-846. Blanco E, Shen H and Ferrari M: Principles of nanoparticle design for overcoming biological barriers to drug delivery. Nature Biotechnology 2015; 33(9): 941-951. Pridgen EM, Alexis F and Farokhzad OC: Polymeric nanoparticle drug delivery technologies for oral delivery applications. Expert Opinion on Drug Delivery 2015; 12(9): 1459-1473. Kapoor DN, Bhatia A, Kaur R, Sharma R, Kaur G and Dhawan S: PLGA: A unique polymer for drug delivery. Therapeutic Delivery 2015; 6(1): 41-58. Anwer MK, Al-Mansoor MA, Jamil S, Al-Shdefat R, Ansari MN and Shakeel F: Development and evaluation of PLGA polymer based nanoparticles of quercetin. International Journal of Biological Macromolecules 2016; 92: 213-219. Srivastava A, Yadav T, Sharma S, Nayak A, Kumari AA and Mishra N: Polymers in drug delivery. Journal of Biosciences and Medicines 2015; 4(1): 69. Stark WJ, Stoessel PR, Wohlleben W and Hafner A: Industrial applications of nanoparticles. Chemical Society Reviews 2015; 44(16): 5793-5805. Vandervoort J and Ludwig A: Biocompatible stabilizers in the preparation of PLGA nanoparticles: A factorial design study. International Journal of Pharmaceutics 2002; 238(1): 77-92. Chen G, Svirskis D and Wen J: Development and validation of a stability indicating isocratic HPLC method for gemcitabine with application to drug release from poly lactic‐co‐glycolic acid nanoparticles and enzymatic degradation studies. Journal of Pharmacy and Pharmacology 2015; 67(11): 1528-1536. Shaikh HK, Kshirsagar RV and Patil SG: Mathematical models for drug release characterization: a review. Wjpps 2015; 4: 324-338. Lee JH and Yeo Y: Controlled drug release from pharmaceutical nanocarriers. Chemical Engineering Science 2015; 125: 75-84. Chen G, Bunt C and Wen J: Mucoadhesive polymers‐based film as a carrier system for sublingual delivery of glutathione. Journal of Pharmacy and Pharmacology 2015; 67(1): 26-34. Martín MJ, Calpena AC, Fernández F, Mallandrich M, Gálvez P and Clares B: Development of alginate microspheres as nystatin carriers for oral mucosa drug delivery. Carbohydrate Polymers 2015; 117:140-149. Wang Z, Tai LR, McLean D, Wright EJ, Florence GJ, Brown SI and Cuschieri A: Mucoadhesive polymer films for tissue retraction in laparoscopic surgery: Ex-vivo study on their mechanical properties. Bio-medical Materials and Engineering 2014; 24(1): 445-451.
Cooper DL and Harirforoosh S: Design and optimization of PLGA-based diclofenac loaded nanoparticles. PloS One 2014; 9(1): e87326. Ibraheem D, Iqbal M, Agusti G, Fessi H and Elaissari A: Effects of process parameters on the colloidal properties of polycaprolactone microparticles prepared by double emulsion like process. Colloids and Surfaces A: Physicochemical and Engineering Aspects 2014; 445: 79-91. YeF, Barrefelt Å, Asem H, Abedi-Valugerdi M, El-Serafi I, Saghafian M and Hassan M: Biodegradable polymeric vesicles containing magnetic nanoparticles, quantum dots and anticancer drugs for drug delivery and imaging. Biomaterials 2014; 35(12): 3885-3894. Davidov-Pardo G and McClements DJ: Nutraceutical delivery systems: resveratrol encapsulation in grape seed oil nanoemulsions formed by spontaneous emulsification. Food Chemistry 2015; 167: 205-212.24. Moore TL, Rodriguez-Lorenzo L, Hirsch V, Balog S, Urban D, Jud C and Petri-Fink A: Nanoparticle colloidal stability in cell culture media and impact on cellular interactions. Chemical Society Reviews 2015; 44(17): 6287-6305. Hunter RJ: A Text Book of Zeta potential in colloid science: principles and applications. Academic Press, Second Edition 2013. Kirby BJ and Hasselbrink EF: Zeta potential of microfluidic substrates: Theory, experimental techniques, and effects on separations. Electrophoresis 2004; 25(2): 187-202. Takeuchi H, Matsui Y, Yamamoto H and Kawashima Y: Mucoadhesive properties of carbopol or chitosan-coated liposomes and their effectiveness in the oral administration of calcitonin to rats. Journal of Controlled Release 2003; 86(2): 235-242. Saadati R and Dadashzadeh S: Marked effects of combined TPGS and PVA emulsifiers in the fabrication of etoposide-loaded PLGA-PEG nanoparticles: in vitro and in vivo International Journal of Pharmaceutics 2014; 464(1): 135-144. Pramual S, Assavanig A, Bergkvist M, Batt CA, Sunintaboon P, Lirdprapamongkol K and Niamsiri N: Development and characterization of bio-derived polyhydroxyalkanoate nanoparticles as a delivery system for hydrophobic photodynamic therapy agents. Journal of Materials Science: Materials in Medicine 2016; 27(2): 40. Cohen-Sela E, Chorny M, Koroukhov N, Danenberg HD and Golomb G: A new double emulsion solvent diffusion technique for encapsulating hydrophilic molecules in PLGA nanoparticles. Journal of Controlled Release 2009; 133(2): 90-95. Xu H, Paxton J, Lim J, Li Y, Zhang W, Duxfield L and Wu Z: Development of high-content gemcitabine pegylated liposomes and their cytotoxicity on drug-resistant pancreatic tumour cells. Pharmaceutical Research 2014; 31(10): 2583-2592. FengS, Nie L, Zou P and Suo J: Effects of drug and polymer molecular weight on drug release from PLGA‐mPEG microspheres. Journal of Applied Polymer Science 2015; 132(6). Zou W, Cao G, Xi Y and Zhang N: New approach for local delivery of rapamycin by bioadhesive PLGA-carbopol nanoparticles. Drug Delivery 2009; 16(1): 15-23. SreelolaV and Sailaja AK: Preparation and characterisation of ibuprofen loaded polymeric nanoparticles by solvent evaporation technique. International Journal of Pharmacy and Pharmaceutical Sciences 2014; 6(8): 416-421. Faisant N, Siepmann J and Benoit JP: PLGA-based microparticles: elucidation of mechanisms and a new, simple mathematical model quantifying drug release. European Journal of Pharmaceutical Sciences 2002; 15(4): 355-366. Matos M, Gutiérrez G, Coca J andPazos C: Preparation of water-in-oil-in-water (W 1/O/W 2) double emulsions containing trans-resveratrol. Colloids and Surfaces A: Physicochemical and Engineering Aspects 2014; 442: 69-79. Khaled SA, Burley JC, Alexander MR and Roberts CJ: Desktop 3D printing of controlled release pharmaceutical bilayer tablets. International Journal of Pharmaceutics 2014; 461(1): 105-111. Ghori MU, Ginting G, Smith AM and Conway BR: Simultaneous quantification of drug release and erosion from hypromellose hydrophilic matrices. International Journal of Pharmaceutics 2014; 465(1): 405-412. Mudgil M and Pawar PK: Preparation and in vitro/ex vivo evaluation of moxifloxacin-loaded PLGA nanosuspensions for ophthalmic application. Scientia Pharmaceutica 2013; 81(2): 591. Chen G and Wen J: Poly(lactic-co-glycolic acid) based double emulsion nanoparticle as acarrier system to deliver glutathione sublingually. Int J Pharm Sci Res 2018; 9(8): 3199-09. doi: 10.13040/IJPSR.0975-8232.9(7).3199-09. Authors Address: School of Pharmacy, Faculty of Medical and Health Science, University of Auckland, New Zealand.